6 Romantic Valentine’s Day Present Ideas…with NHS Discount of course! Valentine’s Day is a time for you to shine and show your loved one how much you really love them. Buying the wrong gift, or even no gift at all, can be disastrous and isn’t something that will be forgotten in a hurry. So, if you’re racking your brains trying to figure out what to buy this year don’t panic, here’s our best Valentine’s Day present ideas, with some even better NHS discounts. At home or abroad, exploring a new city or an old favourite is always exciting. You and your partner might fancy some retail therapy, do a bit of sightseeing, enjoy sipping on a few cocktails, or have a romantic meal at a nice restaurant. Book your city break with Superbreak from £57pp plus an extra 10% NHS discount. You can also add discounted rail, theatre, concert and sightseeing tickets. Nothing says I love you more than a stunning piece of jewellery. Goldsmiths do a fantastic range of the finest jewellery and watches that would make the perfect gift this Valentine’s Day. Get an exclusive 10% off at Goldsmiths with our discount code. A cottage break at this time of year is perfect for romance. Beautiful, crisp, wintery walks, a cosy wood burning fire, snuggling up on the settee to watch a good film; sounds perfect. Book a romantic Valentine’s cottage break from only £215, plus you get an extra 7% NHS discount with Cottages.com. Lovehoney is an award-winning, online retailer that specialises in all things pleasure for adult customers. They have a huge range of quality products that are perfect for couples to enjoy a special night in this Valentine’s. Get up to 50% off plus an exclusive 15% NHS discount. No, not bangers and mash! If staying in is more your thing this Valentines, why not try something a little bit different? Bring out your inner chef with a Gousto Recipe Box and cook up a tasty dish for your partner. The box is delivered straight to your door and you can choose from 12 delicious, healthy recipes. Try a Gousto box for £9.99 instead of £35 with our voucher code. Red Letter Days have some fantastic offers on Spa and Pampering Days that are guaranteed to add a romantic touch to your Valentine’s this year. Enjoy treatments, jacuzzi, swimming pool, sauna, champagne and lunch with one of their spa offers. 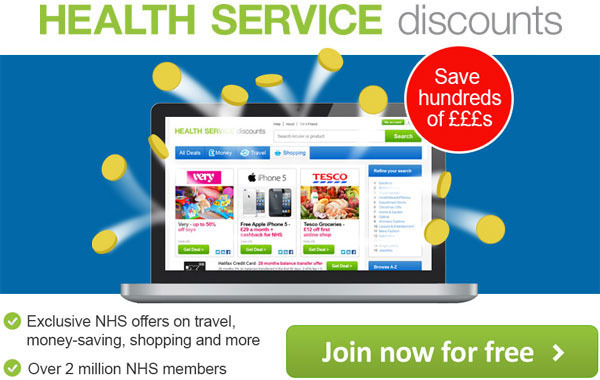 You can get 20% extra NHS Discount with our voucher code.